First of all, we would like to thank those who have already applied to teach the PR course either by opening a new school or in an established venue. We were genuinely excited by the enthusiastic reception to our initial announcement, and have already run orientation days for our first 3 schools, all of which will be announced very shortly. The course has been developed taking into account the comments from our recent surveys and feedback from students over the last couple of years. It was important for us to listen to what everyone had to say, and this has been a huge factor in the process. Hopefully, this short outline will answer a few initial questions you might have and show you what we are doing. So what is different about the Professional Reflexology Practitioner Diploma? 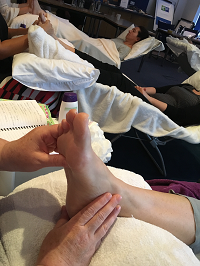 The course written by practicing reflexologists and tutors with over 50 years experience, has a modern, focused structure with a high proportion committed to practical reflexology. The course consists of five core units, essential to providing a high-quality basis for training. Unique to the PR Diploma, each school chooses a set number of additional units from our ancillary unit list. This means that they will be able to choose, teach and gain recognition for subject areas about which they are passionate. And as we all know, if you’re passionate about something, then it’s most likely you will do it better! We know that this will have a hugely positive & inspiring effect on the learning experiences of students. We are the first to introduce mandatory minimum hours of in-class practical training, and we have ensured that all aspects of the course are relevant to the practising Professional Reflexologist. Another aspect of which we are proud is that we are dedicated to making use of technology and keeping everything as "green" as possible. We have, in our own schools over the last few years, developed and tested an easy-to-operate “cloud” based system which will be invaluable, not only for students but in helping schools to administer coursework, case studies and marking etc. This will keep everyone’s paperwork and printing to an absolute minimum. In order for you to run a school, you must have a minimum of three years as a practising reflexologist and have a relevant teaching qualification. If you meet these criteria we will invite you to attend a 1-2-1 Orientation Day to get to know each other and to explain and discuss all aspects of the course units, philosophy and procedures. We will also be able to illustrate the unique level of help and support that will be available to you! We are totally committed to ensuring that our quality assurance is vigorous in order to maintain the highest of standards across all of our schools. Once again our methods are unique. When a school is established, we have innovative systems in place to enable both internal and external verifiers to evaluate standards as the course progresses, rather than annually. If you are as excited as we are, and are interested in running a PR school, then we would love to hear from you!